CDR FoodLab® allows to perform lactose determination in milk in accordance to the reference method (HPLC), that requests training, special skills and so much time at disposal. Instead with CDR FoodLab® you can estimate the lactose in milk and dairy products with a simple analysis method, in 10 minutes. In few steps you can obtain reliable and accurate results. 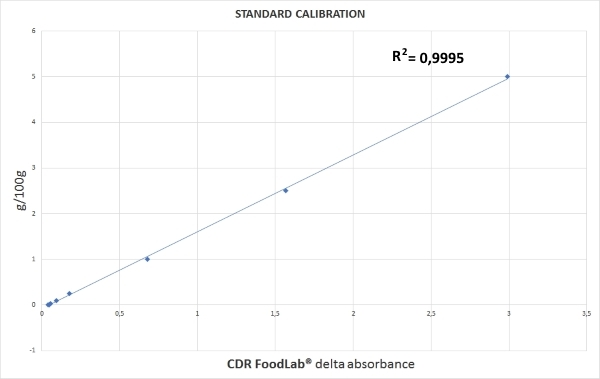 The CDR FoodLab® method can work easily on liquid or solid samples. For the latter it is required a very quick sample pretreatment in order to extract the solution for the analysis. The test is suitable for use on lactose free products, where a part or all the lactose has been broken down to glucose and galactose by the lactase enzyme, it is also suitable for products where lactose is normally present. In this work the new method for lactose determination, that is in CDR FoodLab®, is assessed in terms of reproducibility, accuracy and recovery. New method and traditional enzymatic method are also taken into comparisonon adding determined aliquotes of lactose in reallactose-free matrices. The calibration curve was performed with lactose standard solutions. Lactose is a disaccharide sugar that is found in milk and is formed from galactose and glucose. Lactose makes up around 4.5~5% of milk (by weight). The enzyme lactase is essential for digestive hydrolysis of lactose in milk. Deficiency of the enzyme causes lactose intolerance. Lactose is split in glucose and galactose. Glucose reacts with a phenolic compound through an enzymatic reaction, with peroxidase, and forms a pink coloured complex. The absorbance of the complex is read at 505 nm, and the value is directly proportional to the concentration of lactose in the sample. Cheese, yogurt, cream: weight 10 gr of sample and add 100 mL of distilled water. Mix in a Stomacher for about 3 minutes. Take the filtered solution to test. Lactose was last modified: March 7th, 2019 by CDR s.r.l.